You can’t go wrong with a Jeep WK Grand Cherokee. This heavy-duty piece of machinery can do it all. But you’ll need a lift kit if you plan on going off-road. A lift kit gives you extra ground clearance, so you don’t have to worry about rocks, gravel and other obstacles tearing up the underbelly of your SUV. You can also add some truly massive tires to your ride, giving you more traction in the mud and snow. Having a lifted SUV will also help you stand out on the road. Everyone will know you’ve got the meanest ride in town. Adventure is just around the corner. 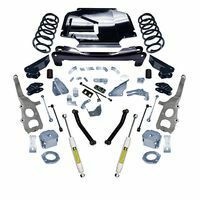 Take your SUV even further and invest in one of these Jeep WK Grand Cherokee lift kits today!